Hot Shops Art Center is home to more than 80 local professional artists and multiple gallery spaces. Although I haven’t yet attended one, I’ve heard the bi-annual Open Houses are amazing and grow in popularity each year. A visit to the Hot Shops is definitely now on my artist’s date list! As an amateur artist, never in a million years did I think that I’d have the opportunity to create art in such an inspiring place, but the weekend of October 13th a dream I didn’t even know I had, came true. The night before, with no small amount of nervousness about the workshop and jumping into unknown territory, I loaded up my car with a laundry basket full of supplies, along with a half dozen big scary canvases. The name of the workshop was “Big Juicy Abstracts,” taught by Beverly Todd, a local professional artist, and beautiful human being. The list of materials, which included canvases, specifically called out the requested size of canvas. 38″ x 38,” as a starting point – in case you’re wondering, that’s equivalent to the height of a taller than average three year old. The majority of my artwork has been completed on canvases and pieces of drawing paper between the sizes of 5″ x 7″ and 10″ x 20″, with two exceptions. 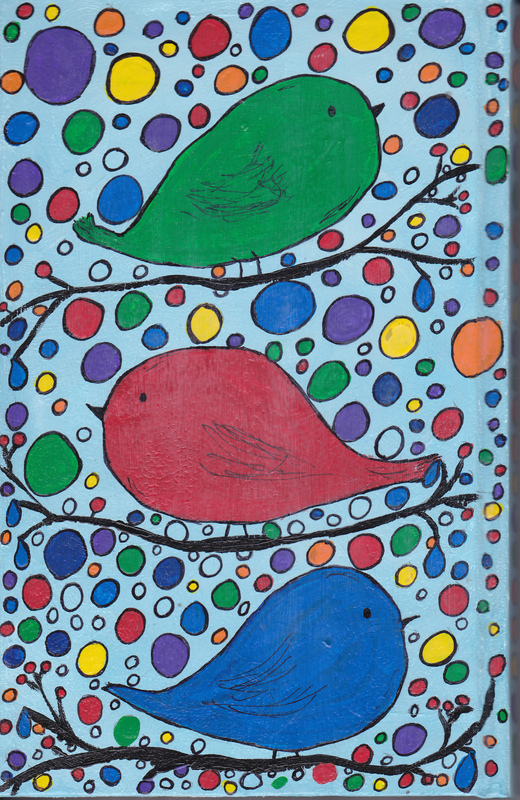 The first and most significant was the three little birds painting I created a few years ago at a friend’s request. and through spending countless hours on YouTube channeling the techniques of other artists to create something uniquely mine. I’ve learned a lot, have had tremendous fun experimenting, but something has been missing – the opportunity for a more structured, hand’s on learning environment. I didn’t realize how hungry I was for such an opportunity until I saw the promotional post for the workshop in my Facebook feed. Although I normally dislike the promo zone on Facebook, in this instance I was grateful for it. The weather was gray and gloomy, but my spirits were high as I unloaded my car and traversed to the open studio space. I was the last to arrive, which surprisingly meant that I ended up with the best spot in the room, the one with the most natural light. I set up my station as quickly as possible and settled in to learn and explore. Abstract art is an interesting concept, so often we judge “good art” based upon how accurately it represents our physical world. In other words, how well the artist recreated a landscape or the impression of a person or an object through paint, ink or pencil. What I know now, is that part of makes abstract art great – is exactly that. It’s created from the heart and soul, from a place of feeling. A place that’s sometimes happy and sometimes sad – a place that’s completely human. That’s how children create, from the heart and without overthinking it. Over the course of the two day workshop, I also learned that while abstract pieces may appear to be randomly assembled to the untrained eye – there are very purposeful intentions behind the patterns that have emerged on the canvas. We took time to “loosen up” and try some creative techniques on for size, things like making marks on a canvas with charcoal before painting. Seemingly insignificant actions, with unexpected outcomes. By putting myself into a playful state of mind, and by following the intuitive input of the teacher – I quit procrastinating and painted. I’m not going to lie – it was a struggle to get to this point. The concept of painting on a such a large canvas was intimidating, and watching the seasoned artists around me fill their canvases with paint made me pause and wonder whether or not I was in the right place. In many preceding drawing and painting classes, I’d never completed the work during the allotted class time. Frozen by my comparing mind, I’ve almost always allowed perfectionism to trump playfulness. What I came to understand later in the day, as we shared our art – and what we learned, is that I’m far from alone. Even the most experienced artists in the group felt like they’d stepped way outside of their comfort zone and were unsure, but happy with where they had landed. As it turns out, we’re not really alone. We just need to be brave enough to try. 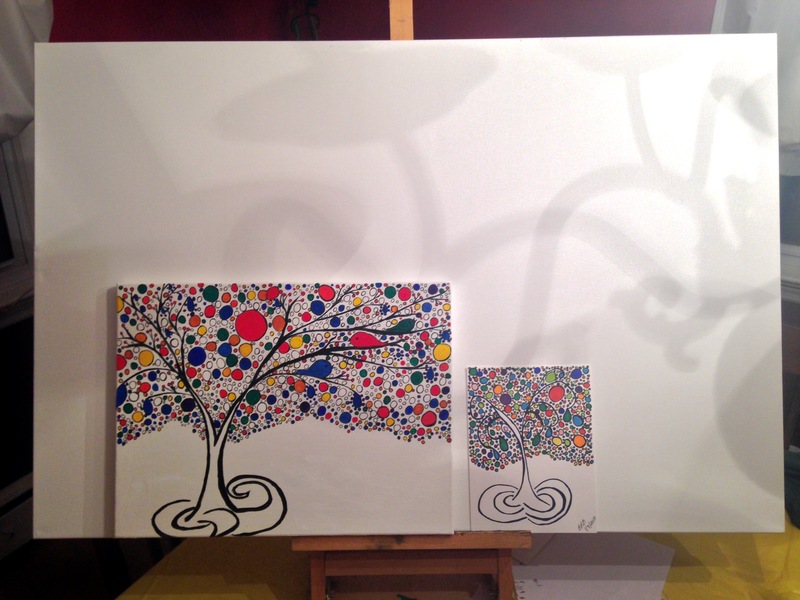 In an unprecedented weekend, I completed not just one – but three pieces of art. I do believe it’s the first time, outside of a paint and sip experience, that I’ve actually completed a piece within the time-frame allotted. This piece was particularly daunting, the size of the canvas was beyond my imagination, or so I thought. It was a fabulous high energy weekend! I somehow think it’s a glimpse into the future. After nearly a year of art journaling and drawing my way through some seriously faith testing times, I’ve landed in an amazing place. I never would have dreamed that my perfect job in a perfect place would be back in Omaha, Nebraska – but here I am! Although Omaha has been my city of residence on three separate occasions and for the majority of my life, moving back hasn’t been without more than a few adjustments. Some of them I foresaw and have been easier than expected. It hasn’t been nearly as difficult as I thought it might be, to get up every day and put on “real clothes,” makeup and drive to the office instead of padding downstairs to my desk wearing yoga pants and fuzzy socks. The perfect hair salon practically dropped into my lap and the location of my apartment couldn’t be better suited to my lifestyle and interests. Others, like living alone, are taking me longer than anticipated to feel comfortable with. Slowly but surely I’m adjusting to living in an apartment and to evenings and weekends without impromptu visits, bear hugs and sharing a plate of appetizers at Fridays with my youngest son. The one area of my life that I expected to flow from the East Coast to the Midwest without disruption, was the relationship with my inner artist and creativity. It didn’t. I don’t know if it’s because I didn’t identify myself as an artist or a writer during my previous life in Omaha or if it’s because my new apartment doesn’t have the clearly defined studio space I’d hoped for. Whatever the cause may be, it’s been far more difficult to tap into my inner child and let the art flow than expected and for some reason, I simply stopped making art. Mid-December marked nearly four months of my paint supplies being tucked away in a drawer and my unfinished ink journal and favorite pens sealed in a gallon size baggie. Every time I thought about drawing or painting, nothing would come out. 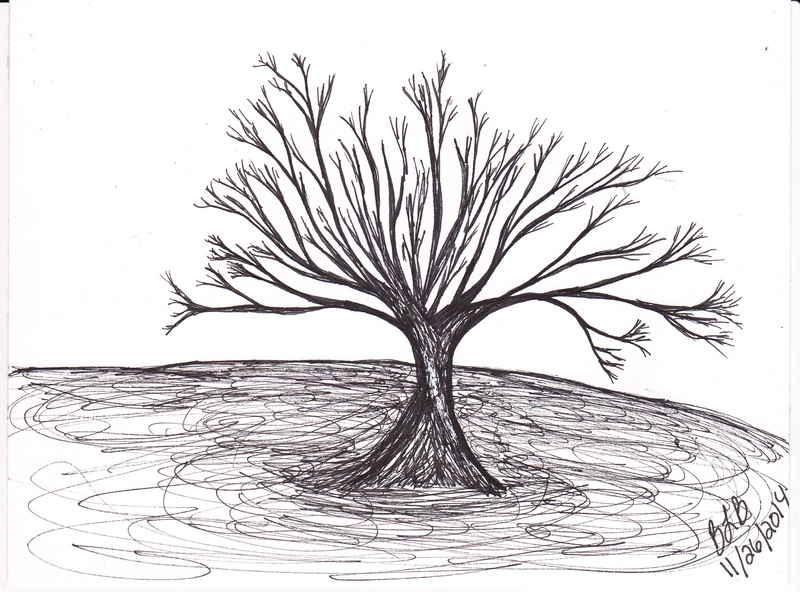 It was as though the stack of ink drawings and the nearly completed art journal had been created by someone else. 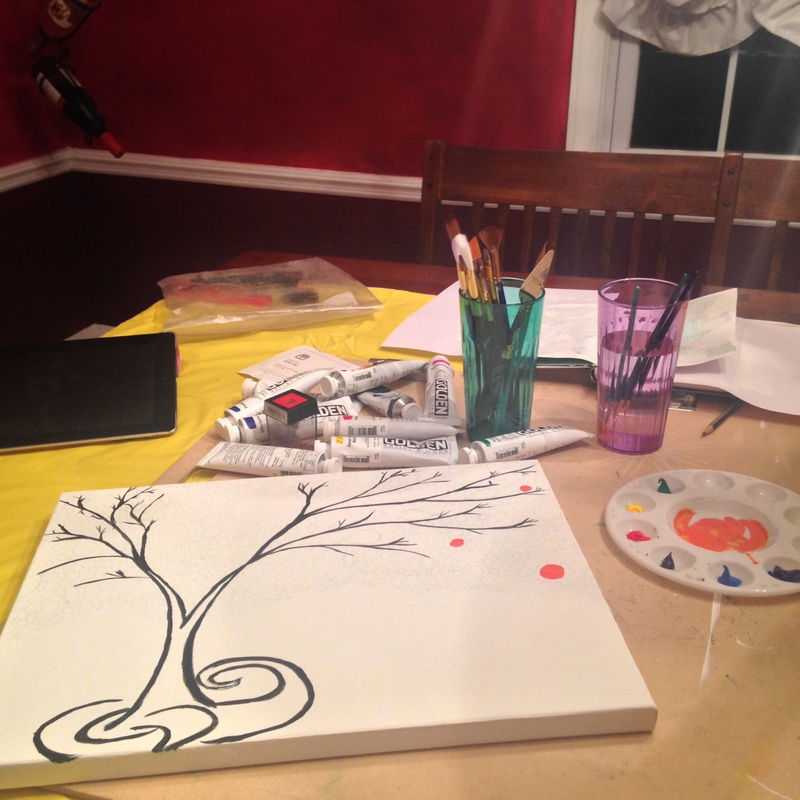 Art classes are difficult to find in the dead of winter, and so after hearing positive things about the local paint and sip studios I decided to give one of them a try as a way to jump start my creative journey in Omaha. 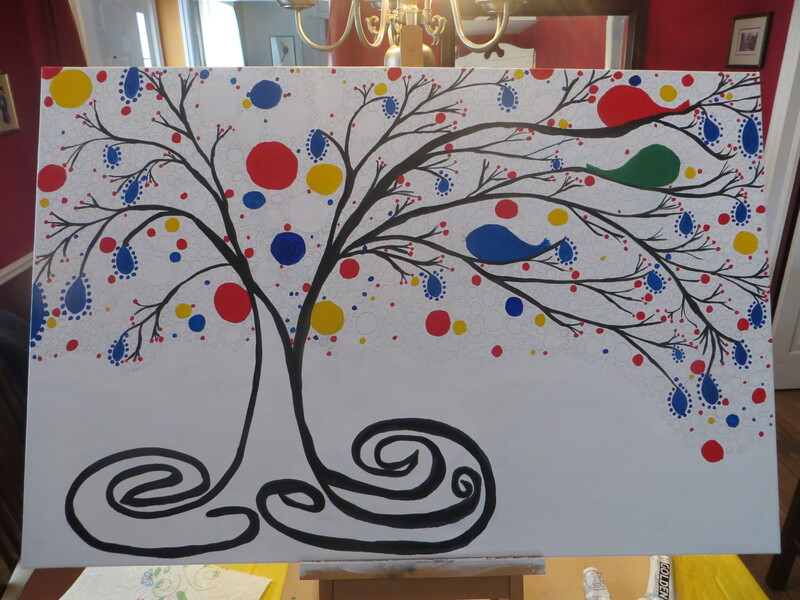 Paint and sip franchises such as the Corky Canvas and Canvas and Cabernet are springing up across the country. They offer a “unique way to uncork your creativity,” in other words they serve wine and other libations to patrons that are brave enough to paint, many for the first time since kindergarten, in a group setting. My first experience was interesting. The studio felt empty. In spite of the bitter temps outside, the room quickly warmed up with artistic enthusiasm. The instructor led us through the painting step by step, and offered individual guidance to the budding artists in the studio. The music selection ranged from songs that took me back to high school day to modern day hits, that thanks to my kids, I not only recognized – but could even sing along if I felt so inclined. 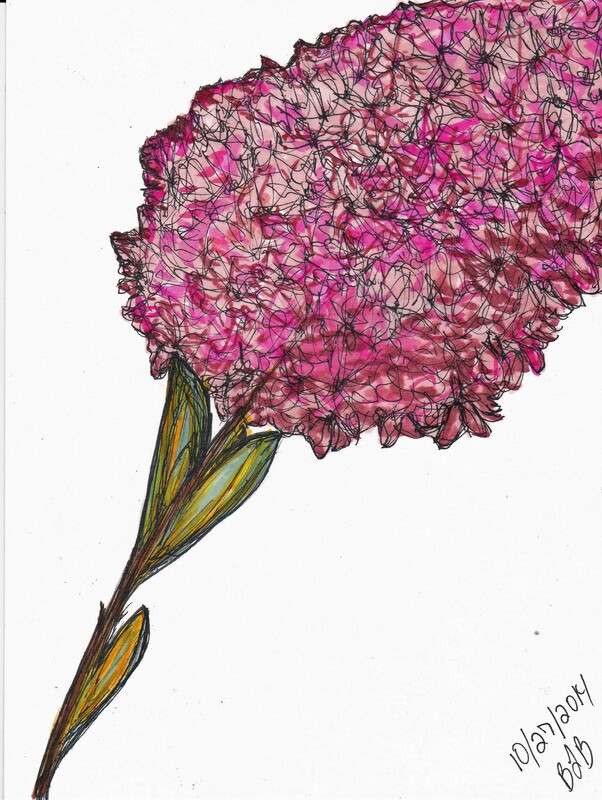 and, albeit a much simpler floral piece, was the subject of my first group art session in Omaha. Much like the first time I dipped my toe into the world of art, my goal on that frigid Saturday morning was to create a “masterpiece” that matched the original artist’s work. Success meant replication rather than interpretation, in spite of the instructor’s encouragement to change up colors and/or do something different if we felt so inclined. 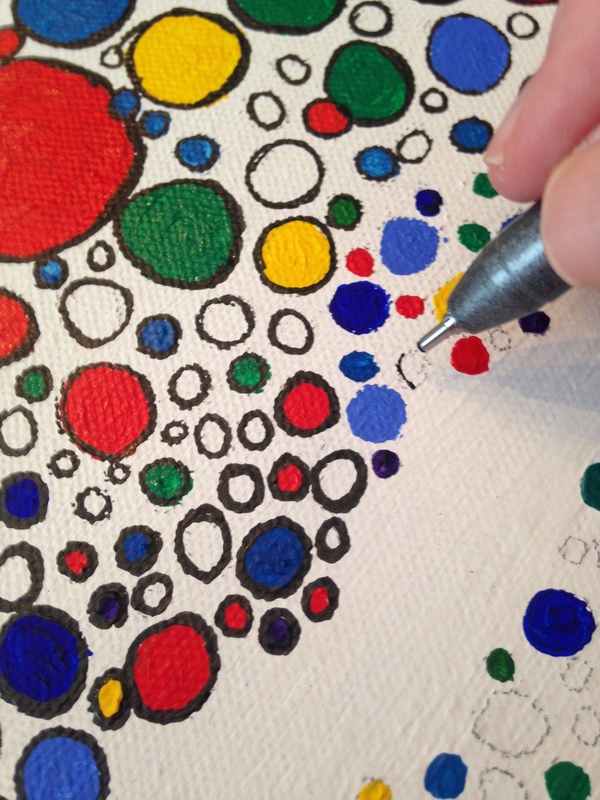 It may seem unlikely to some, but for me, the Corky Canvas and its sister paint and sip venues became a way to bridge the gap between who I was when I left Omaha and the artist I discovered in Pennsylvania. With each new session, I’ve grown a little more daring and instead of using the painting on the schedule as a template, it’s simply a source of inspiration with guidance provided by the instructor. 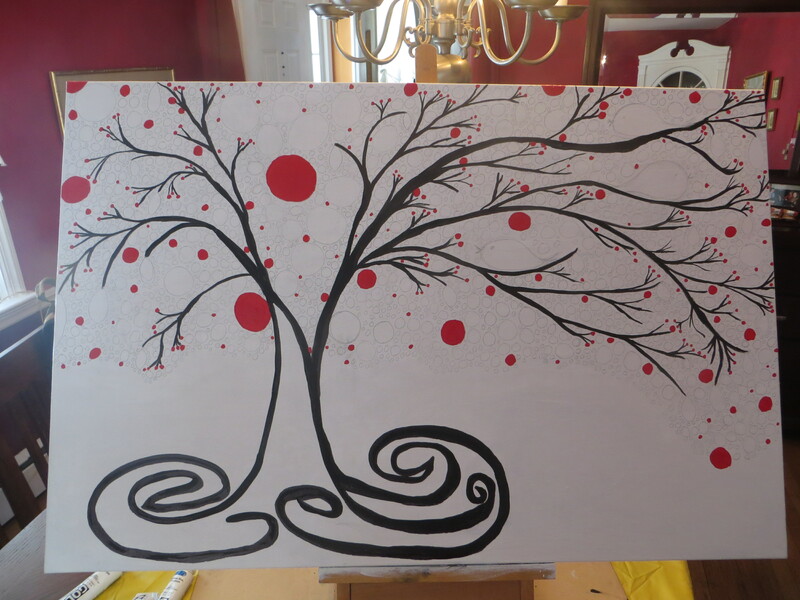 First, I went totally crazy and painted a huge moon, filled the branches with petals and made the blossoms on the tree pink instead of white. Next, I went out on a limb (pun intended) and painted three birds instead of two. The background was lighter than the model painting, the field below was quite different and for the first time, the branches started feeling like my own. The creative block ended on Valentine’s weekend. Picture a red umbrella at the bottom of a grey and white cobblestone path lined with quaint street lamps and a picture perfect silhouette of a couple dancing in the rain at the opposite end. As much as I love the idea of the picture perfect couple dancing in the rain, it didn’t work for me. It’s not where I am right now. And so instead, the path in my painting turned out to be tempered with color and emotion. The umbrella is disproportionately large, but for some reason I love it. Rather than a couple dancing in the rain, the silhouette is me. A woman, yet at the same time still a girl, reaching out to pass through the curtain of rain into a place and time that is filled with more blue skies than gray. Last weekend brought me back to the more whimsical me. The first piece I created in my new studio is very fitting. It ties together so many experiences from the place that I moved from to the home that I’m in the process of making. It’s a reminder to remain in the present rather than speculate about the future. It’s almost impossible for me to believe that it’s been 3 months since I first wrote about my 3 Little Birds Project. Where does the time go?! It all started with the size and medium that has become my favorite and that I’m most comfortable with. 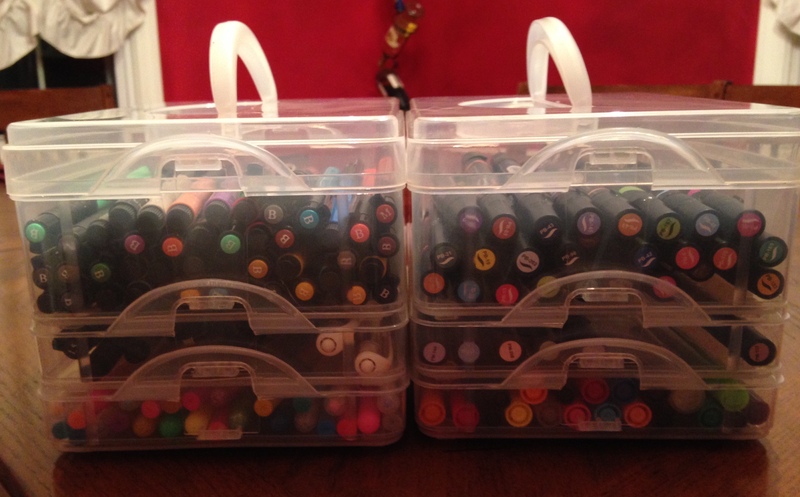 My collection of ink pens and markers is well organized and I’ve also been told it’s also enviable. During the months leading up to the 3 Little Birds project, I’d grown extremely comfortable using ink on canvases the size of a greeting card to create a variety of drawings inspired by nature. I was content spending my evenings immersed in this world of comfortable familiarity. 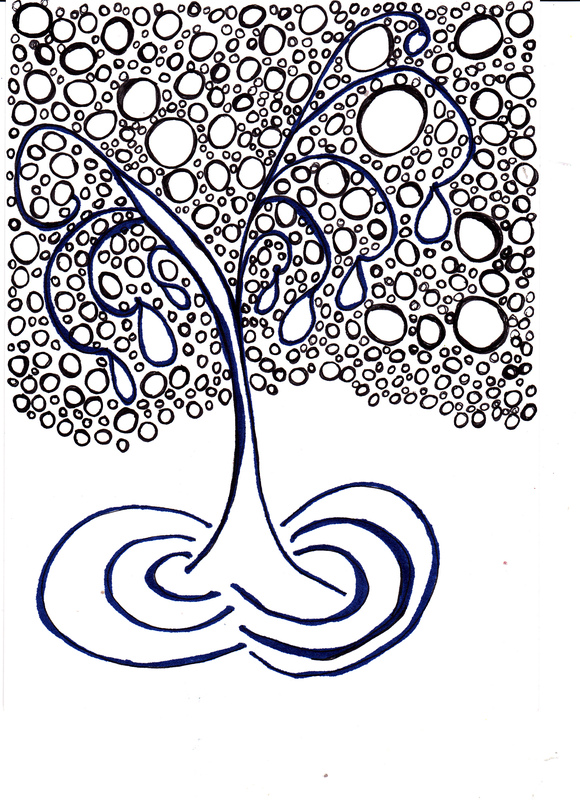 It was without conscious intention that I branched out slightly in subject matter and a sea of swirling dots and teardrops became the leaves on a tiny whimsical tree. 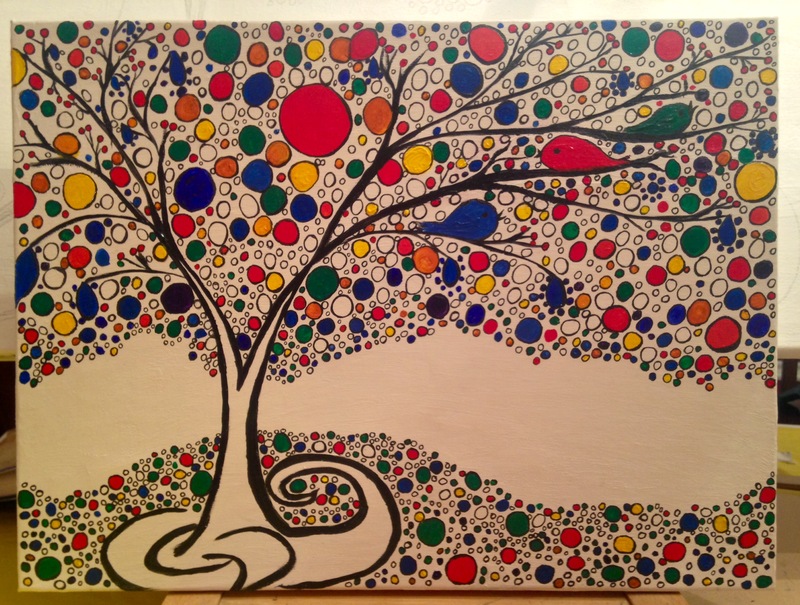 An explosion of color brought the tree to life. 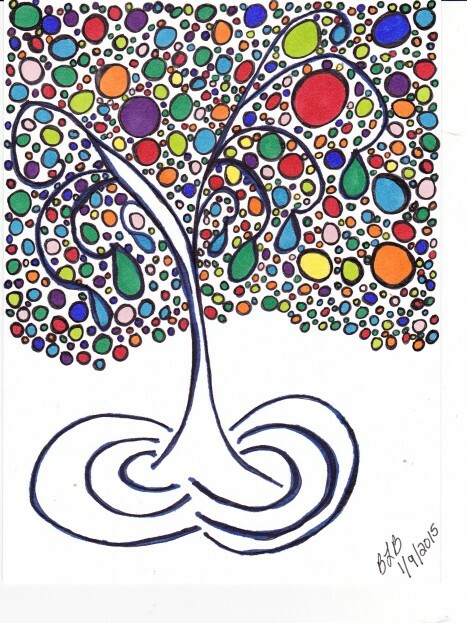 Little did I know, that this small step out of my comfort zone would set the wheels in motion and lead me into an unfamiliar and somewhat intimidating place: a friend of mine reached out and asked me to do a painting for her inspired by this whimsical tree and her anthem, Bob Marley’s song Three Little Birds. In some ways it seemed a little crazy to say yes. After all, I had extremely limited experience with painting, had never drawn a bird, and had never drawn anything that big, and it was going to hang over her fireplace for many to see. I don’t know how to explain it, but although it was scary and intimidating, it was also exciting to think about trying something new, big, and different. In the beginning, I stuck with ink to gain confidence in drawing cute little birds and experiment with the color and composition. I bought a canvas and spent a few weeks learning what it felt like to work on a surface other than paper, which brushes worked best, and how to recover from mistakes . At long last I was ready to tackle the final version. Admittedly, the difference in size between the original and the yet to be completed final version of the tree was more than a bit overwhelming to think about. The large version didn’t get off to a smooth start. 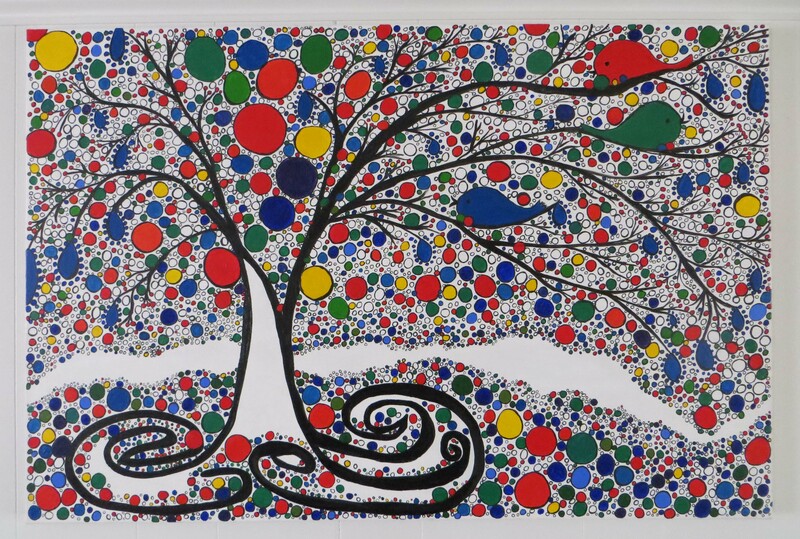 Thank goodness acrylic makes it easy to completely cover one tree with a layer (or two) of paint and allows the artist to keep on going without having to abandon the canvas. added in some yellow, green, and blue along with the three little birds so they wouldn’t get lost. 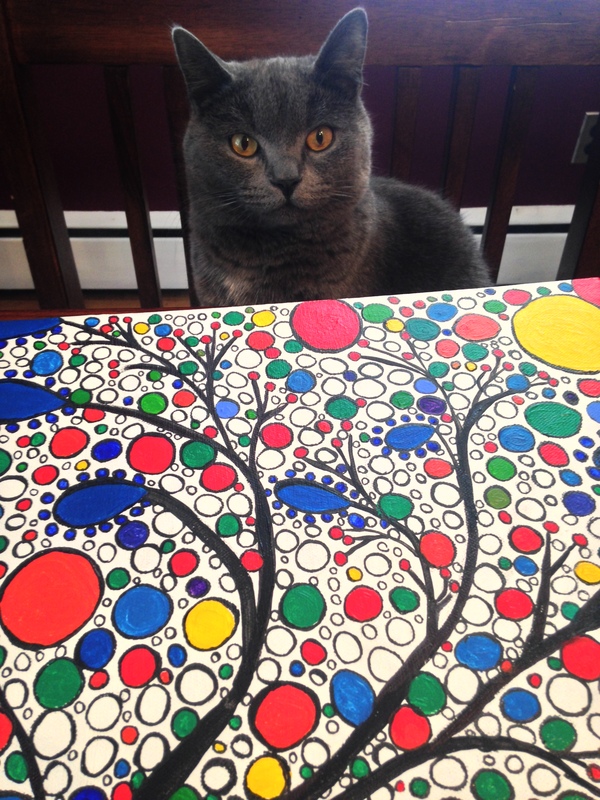 Mia was my faithful art buddy throughout the entire project, although she may have just been interested in keeping an eye on the birds. The devil is in the details. Truth to be told, this was my favorite part of the project. I can lose myself for hours in the small but important details. 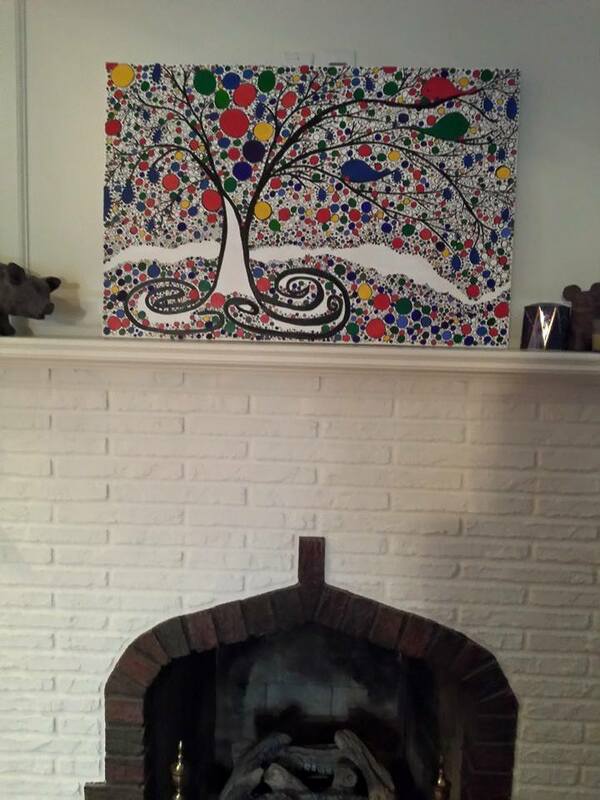 had it packed and shipped to Omaha, NE and it’s now hanging above my friend’s fireplace. The entire project was fun, rewarding, and challenging. It made me stretch in ways that felt uncomfortable at first but ultimately helped me grow and gain confidence. It was another lesson reinforcing the importance of being open to possibilities and the value of saying “yes” to trying something new even if it scares us. Perhaps more importantly it was a reminder that there is potential living within each of us that is far greater than we can possibly imagine. I wish I could have set the slide show to the Bob Marley tune, but licensing it was a bit out of my price range, so I opted for something free and “sunny sounding. Silly Rabbit, Piano Lessons are for Grown-Ups! © Beth Lee Browning and it’s a whole new world, 2011- 2019. Unauthorized use and/or duplication of this material without express and written permission from this blog’s author and/or owner is strictly prohibited. Excerpts, links, and pictures may be used, provided that full and clear credit is given to Beth Lee Browning and it’s a whole new world with appropriate and specific direction to the original content.